William McCaffrey is a Board Certified Safety Professional with over 20 years of construction safety experience. He is the Corporate Safety Director for Irex Contracting Group (www.irexcontracting.com) and current Chair of NIA's Health and Safety Committee. He has worked for general, mechanical, electrical, and specialty contracting firms in the industrial and commercial construction markets. He can be reached at WMcCaffrey@irexcorp.com. Even the most safety-conscious workplaces will experience incidents from time to time. How a company responds to an incident is what separates the top performers from the rest. Incident investigation is a forward-looking process with the purpose of preventing future incidents. It is not an exercise in fault finding and finger pointing. Consider, for example, an incident where a load is dropped from an overhead crane. If the investigation stops at the fact that an employee used a damaged sling, that company is likely to have future crane-related incidents. The investigation should uncover, among other questions, why the sling was damaged; whether slings were being inspected on a regular basis; whether they are appropriate for the loads being hoisted; and whether employees are trained on rigging and crane use. An incident can be described as any unintended event that results in injury or property damage, or has the potential to do so. Most safety professionals now prefer the term incident over accident, because the term accident implies that it was unavoidable. Incidents also include close calls, usually referred to as near misses. In the example above, even if the load was not damaged, and nobody was hurt, it should still be investigated due to the potential for serious injury or damage to occur. Incident investigation should be a formal systematic process and key employees should be trained in the process. It should be a team effort with both management and employee involvement. The extent and detail of an investigation should be appropriate for the severity, or potential severity, of the incident. At a minimum, companies should have forms for incident reports and witness statements. Investigations may also involve pictures, measurements, and possibly even reenactments (done safely of course). A review of training records, standard operating procedures, job safety analyses, and inspection records should also be part of the investigation. The key of the investigation is to identify all contributing factors that led to the incident. 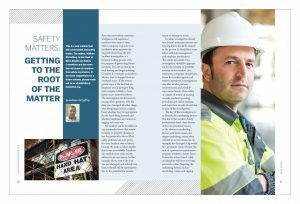 Safety professionals break these factors down into proximate causes, or the obvious contributing factors; and latent causes, the deeper underlying causes, often referred to as root causes. In our example, the damaged sling would be a proximate cause, whereas the lack of a preventive maintenance program would be a latent factor. Corrective actions based solely on discipline will have very little preventive value. Targeting the underlying factors, such as instituting a crane and rigging inspection policy, will have far greater results in preventing future incidents. This article was published in the March 2018 issue of Insulation Outlook magazine. Copyright © 2018 National Insulation Association. All rights reserved. The contents of this website and Insulation Outlook magazine may not be reproduced in any means, in whole or in part, without the prior written permission of the publisher and NIA. Any unauthorized duplication is strictly prohibited and would violate NIA’s copyright and may violate other copyright agreements that NIA has with authors and partners. Contact publisher@insulation.org to reprint or reproduce this content.